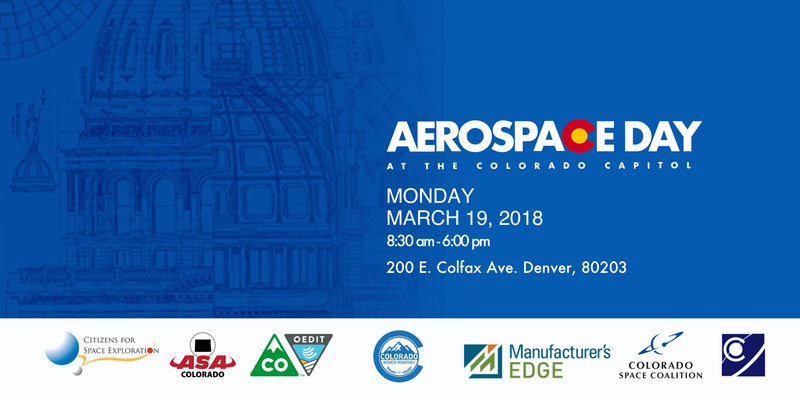 February 20, 2018 – Join the Colorado Citizens for Space Exploration (CSE), Office of Economic Development and International Trade (OEDIT), Colorado Business Roundtable (COBRT), Aerospace States’ Association (ASA), Colorado Space Coalition (CSC), Colorado Space Business Roundtable (CSBR) and Manufacturers Edge in coordination with numerous aerospace partner organizations, for a day at the Colorado State Capitol. Enjoy a full day of networking and dialogue with Colorado Legislators discussing how Colorado became one of the largest space economies per capita in our nation and how they can effectively support aerospace in our state. For more information, or to participate in the planning of Aerospace Day at the Capitol, email Christie.j.lee@lmco.com or call Christie Lee at 303.258.6957.